World War II and celebrity photographer Tony Vaccaro has captured images of death, despair and ecstatic beauty across the globe in a career that has spanned 70 years. In his Long Island City studio, Vaccaro, now 95, is preparing for a European tour. His first stops are in London and Berlin — both spots that he has visited often in his long career. In his 20s, he was a private infantryman in the Army and spent 14 days waiting offshore before the Omaha Beach invasion in France on June 6, 1944. During his years at war, he took more than 8,000 photographs. In the 2016 HBO documentary Underfire: The Untold Story of Pfc. Tony Vaccaro, he said that there was a moment when he decided that he could not kill another person. He threw down his rifle and walked away, but then realized that he wouldn’t be able to reflect on his life and think of himself as a coward. He went back and picked up the rifle. 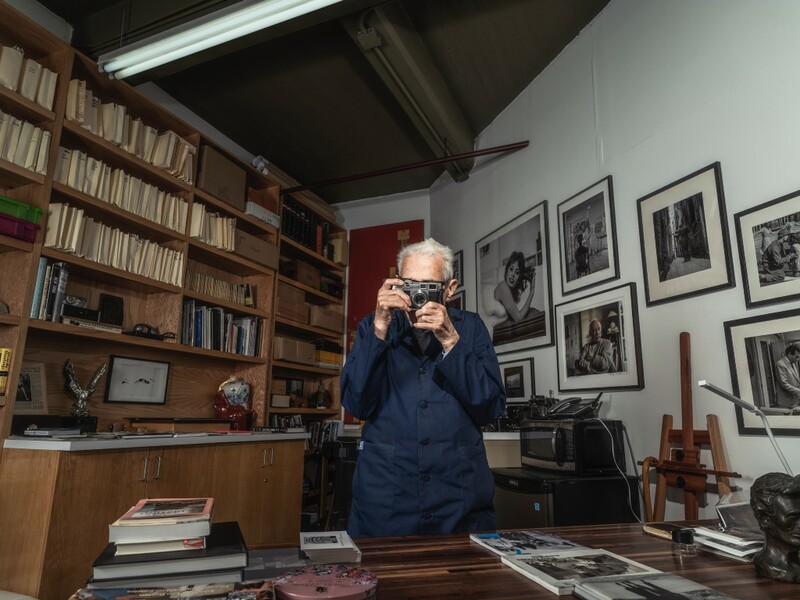 Four years ago, at age 91, Vaccaro told his children that he would like them to preserve his collection of more than one million published and unpublished photos, which were stored in his small Long Island City studio apartment. Today, he sits at a large wooden desk in the corner of his work studio, with no laptop or electronic devices — just stacks of previously published works and prints of unpublished works that Maria and photo technician Manolo Solas labor over every day. To his left are the generations of cameras he used during his seven-decade career, including one from the late 1800s that was left to him by his father. Both of Vaccaro’s parents died when he was 4 years old. He believes that during the war, they were watching over him. Vaccaro was born in Italy, but his parents relocated to the United States and settled in Pennsylvania when he was a child. After they died, he was sent back to Italy to live with an uncle. “He kept Tony black and blue for 14 years,” Maria said. His uncle was an avid hunter and Tony was in awe of his marksmanship. Vaccaro said that when they went on hunting trips together, it was his job to frighten birds out of their nesting places. His uncle was able to shoulder the rifle, aim and shoot down the bird with remarkable speed. Vaccaro admitted that due to his uncle’s frequent threats, he was frightened each time his uncle fired the gun. At the same time, he acknowledged that the marksman tutelage by his uncle helped him become a fast and accurate photographer. After the war, Vaccaro showed his work to Fleur Cowles, a popular writer and artist who was the publisher of Flair magazine. She was interested in one particular war photo: a black-and-white image of a dead Belgian soldier face down in a field with only a third of his body showing through the snow. She asked him if he had experience in shooting fashion, and he told her that he did. Vaccaro said he lied, but it was a lie that launched a decades-long career of photographing and rubbing elbows and creating lasting friendships with some of the most-famed celebrities on the planet. In the 1960s, Vaccaro photographed Italian international movie star Sophia Loren. The two became such good friends that she often stayed with him at his Upper West Side apartment. During one incident, Loren showed up an hour early to a morning photoshoot with Vaccaro. He had just gotten out of the shower and was only wearing a towel when he became aware of her presence. “Sempre pronto [always ready],” she said to him. Vaccaro also photographed actress Shirley MacLaine. His provocative photo showed MacLaine sitting on a swing and wearing a see-through white blouse. When asked what happened to MacLaine’s bra, Maria Vaccaro noted that Vaccaro said he had thought the bra was hideous and had asked her to take it off. In the early 1960s, Vaccaro had the chance to photograph famed artist and cubist painter Pablo Picasso. At the shoot, Picasso was playful and began posing for Vaccaro like a model. “I think he liked me,” Vaccaro said. But he didn’t want to shoot Picasso in that manner, so Vaccaro stopped taking photos. He held the camera up to his ear and shook it. “I think it’s broken,” Vaccaro told the painter. Picasso made a face that indicated he thought that Vaccaro was inexperienced. Discouraged, Picasso crossed his arms and turned his head to the left. Vaccaro quickly put the camera to his eye and snapped the shot. The photo is still hanging in his studio. Vaccaro said that painter Georgia O’Keeffe was cold to him for days while he was photographing her on an assignment in New Mexico. But she began to warm up after she overheard that he had taken photos of famed Spanish bullfighter Manolete before his death in 1947. In the late 1960s, Vaccaro had the opportunity to photograph the famous silent-film actor and director Charlie Chaplin, who was living in Sweden. The two became close during Vaccaro’s extended stay in Europe. “She gave me two boys,” he said. While traveling for work and occasionally relocating to chase the stories, Vaccaro took Anya and his children everywhere. She died of lung cancer in 2013 at age 71. Today, sitting at his desk, Vaccaro keeps the Leica camera he carried with him during World War II close at hand. As he pores over his seven decades of work, his daughter-in-law at his side, he can’t help but remember the stories that accompanied the images. Vaccaro retired in 1982, but he still takes photographs on film. “We will never switch to digital,” Maria said. The team has yet to uncover a plethora of photographs that Vaccaro took on a 46-day walk along the Nile River as a young man. He remembers traveling at night to avoid the heat of day. At the end of his journey, he took photos of Egyptian Colonel Gamal Abdel Nasser and his family. One night, Vaccaro found himself looking out over a body of water in which Roman columns were visible. He felt proud that he was in a place where Romans had been 2,000 years before. He knew then that he had made the right choice about what was to be his life’s work.